A few weeks ago I asked friends about signs of revival. 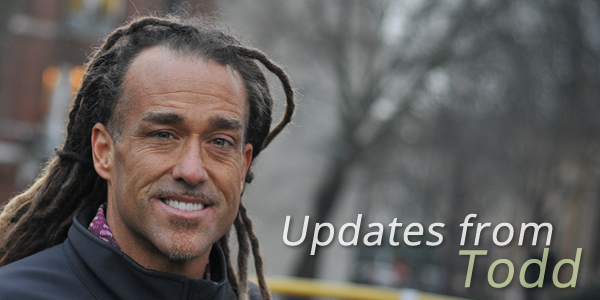 Along with other reports, Revd Bill Smith sent the following update from evangelist Todd White. It covers indications of a global move of God. “Merry Christmas!! Thank you for taking the time to read this letter and rejoice with me as I continue to see the body of Christ awaken to who she is and walk out lifestyle Christianity. I have seen amazing things happen these past couple of months. “I had the privilege of speaking at the YWAM National Leadership Conference in Victoria, Australia. YWAM (Youth With A Mission) is an amazing organization that has already sent out 12 million people into the mission field since its inception. My speaking schedule was intense. I preached eleven two-hour sessions in three and a half days. I had leadership meetings with many different people from YWAM. It was an explosive time of truth. There were lots of tears, and lots of changed hearts. My heart was to bring the active sharing of Jesus so that everywhere they went, they could take the supernatural gospel with them. I talked about identity and how we are an open heaven everywhere we go because Jesus opened the heavens. The heavens were opened to him because he obtained righteousness. Now, we are an open heaven because “Jesus who knew no sin became sin so that we might become the righteousness of God.” (2 Corinthians 5:21). “So, YWAM had set up to go on outreaches to 37 cities following this conference. During the conference, God did a sign and wonder in the sky over the first city of the outreach. A cloud appeared over the city and in the midst of the cloud, there was a huge opening with a rainbow straight through the center of it. It was a picture of an open heaven. “People were freaking out over this cloud and the news media to this day cannot explain it! We are truly an open heaven wherever we go! “Then I went to speak at The Empowered Evangelism Conference in Frankston, Australia. There were over 500 evangelists from all over Australia who attended the conference. We trained in power evangelism and there were all kinds of testimonies of people being saved, healed, and delivered. It was an amazing time of empowerment. During one of the sessions, I was talking about how we are an open heaven and how God will cause it to rain and He will bless everything we do. Matthew 6:33 says, “Seek first the Kingdom of God and His righteousness, and all these things will be added to you.” It is the things in Deuteronomy 28 that will be added to you. When someone fulfills righteousness, these are the blessings of obedience. As believers, we step into Jesus’s obedience. We step into right standing with God. So as I am sharing this message during the last night of the conference, something like raindrops start falling on me. So, I moved to the right and then to the left. I thought something may be leaking or maybe I was sweating. I soon realized that it was neither. It was literally raining inside the building as I was preaching on an open heaven and it was not raining outside. It was raining over the pulpit and the stage. We called people up for prayer and then the rain became noticeable by the people. Many started rushing toward the stage to get rained on. God created a sign and wonder to show that He wants it to rain. It was very powerful. “After Australia, I spoke at the North Carolina School of Power and Love. During the conference, I probably shared one of the clearest messages on righteousness that I have ever shared. As I was pouring my heart out on righteousness, it started to rain inside the building again. But this time it was dropping all over the sanctuary, not just upfront. God wants us to be an open heaven every day no matter where we are or what we are doing. I got to watch many people who would normally never step out, step out at this conference. It was so good! “From there, I flew to Argentina to minister at a youth conference. I spoke that night to 3000 youth. There were many healings and miracles. During one of the morning sessions, God told me to personally lay hands on every youth there. It was an incredible time of impartation and baptism of fire. He touched these youth so wonderfully. It was beautiful! This entry was posted in Christianity, Jesus, Revival and tagged Heaven/hell, Open heaven by Richard Barker. Bookmark the permalink.